Knowing how to couple and uncouple correctly is basic to the safe operation of doubles and triples. Wrong coupling and uncoupling can be very dangerous. Coupling and uncoupling steps for doubles and triples are outlined below. 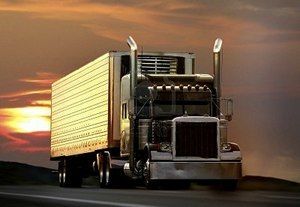 If the second trailer does not have spring brakes, drive the tractor close to the trailer, connect the emergency line, charge the trailer air tank, and disconnect the emergency line. This will set the trailer emergency brakes (if the slack adjusters are correctly adjusted). Chock the wheels if you have any doubt about the brakes. A converter gear or dolly is a coupling device of one or two axles and a fifth wheel by which a semitrailer can be coupled to the rear of a tractor-trailer combination forming a double bottom rig. Caution: For the safest handling on the road, the more heavily loaded semi-trailer should be in first position behind the tractor. The lighter trailer should be in the rear. If the distance is not too great, wheel dolly into position by hand so it is in line with the kingpin. Position combination as close as possible to converter dolly. Move dolly to rear of first semi-trailer and couple it to the trailer. Secure dolly support in raised position. Pull dolly into position as close as possible to nose of the second semitrailer. Unhook dolly from first trailer. Wheel dolly into position in front of second trailer in line with the kingpin. Back first semi-trailer into position in front of dolly tongue. Hook dolly to front trailer. Secure converter gear support in raised position. Make sure trailer brakes are locked and/or wheels chocked. Make sure trailer height is correct (it must be slightly lower than the center of the fifth wheel, so trailer is raised slightly when dolly is pushed under). Back converter dolly under rear trailer. Raise landing gear slightly off ground to prevent damage if trailer moves. Test coupling by pulling against pin of number two semi-trailer. Make visual check of coupling no space between upper and lower fifth wheel. Locking jaws closed on kingpin). Connect safety chains, air hoses and light cords. Close converter dolly air tank petcock and shut-off valves at rear of second trailer (service and emergency shut-offs). Open shut-off valves at rear of first trailer (and on dolly if so equipped). Charge trailers (push “air supply” knob in) and check for air at rear of second trailer by opening the emergency line shut-off. If air pressure is not there, something is wrong and the brakes will not work. It isn't very likely you will connect to a trailer without spring brakes, but a question about this still comes up from time to time on the written exam. While you don't necessarily need to memorize the definition of a converter gear or dolly, you should have a solid understanding of what its purpose is. This is very important to remember! Always have the heaviest trailer closest to the tractor. There is a very good chance this will show up on the written exam. Written exam questions commonly refer to trailer height positioning. The trailer should raise slightly when the dolly is pushed under it. You should always check the emergency line shut off valve instead of the service line shut off valve. The service line shut off valve will not have any air escaping it unless somebody is depressing the brake pedal or the trailer hand valve is engaged. It's better practice to check the emergency line. Refers to pulling two trailers at the same time, otherwise known as "pups" or "pup trailers" because they're only about 28 feet long. However there are some states that allow doubles that are each 48 feet in length. How are dolly brakes released when not equipped with spring brakes? Do converter dollies have spring brakes? Release dolly brakes by opening the air tank petcock. (Or, if the dolly has spring brakes, use the dolly parking brake control. For the safest handling on the road, the more heavily loaded semi-trailer should be in first position behind the tractor. The lighter trailer should be in the rear. Which of these steps to connecting the converter dolly to the rear trailer is incorrect? Charge trailers (push "air supply" knob in) and check for air at rear of second trailer by opening the emergency line shut-off. If air pressure is not there, something is wrong and the brakes will not work. What is a converter gear or dolly? A coupling device of one or two axles and a fifth wheel by which a semitrailer can be coupled to the rear of a tractor-trailer combination forming a double bottom rig. How do you check to make sure the trailer height is correct before coupling? The trailer must be slightly lower than the center of the fifth wheel, so the trailer is raised slightly when dolly is pushed under.